We were going to name this post "Spring Clean Your Gmail Inbox," so clearly you're not the only one procrastinating when it comes to spring projects. Better late than never though—and this guide is going to change your work life. Is email eating up half your day? Do you have an inbox so full of unanswered messages that you're ready to declare email bankruptcy? We feel ya. And we'd like to help you take back control of your inbox. Much like inventory management, solid email management can deliver extra hours in the day and totally shape up the way you run your business. 1. Think of your inbox as a reception area. That's not where you keep the email—it's where the email waits. It's too easy to get sucked in for hours, so check it only a few times a day. If you have the self-control, shut down the email notifications from your phone so you can avoid distraction. You can always go in and check, but this way you're not disrupted by another promotional email. 2. Make labels. With the searchability of Gmail, it's easy to forget labels altogether, but two important labels help us organize our email: "Follow-up" and "Waiting." "Follow-up" is for non-urgent emails that require us to spend longer than two minutes responding. "Waiting" is for emails we've sent that require a response from someone else. We also set up labels based on Gmail's filtering options as well, but those will be different for everyone. 4. Use the two-minute rule moving forward. David Allen's process involves working through your inbox, deleting extraneous emails (unsubscribing, muting and filtering messages as you can), responding to emails that require less than two minutes of your time, and then labeling and archiving the others. If something needs a longer response or simply requires more time to figure out, label it "Follow-up" and archive it for later. We find it useful to check email on the phone first (archiving and deleting with swipes is so satisfying)—then it's just the real meat left in the inbox when you get to your desk, to which you can respond without as much distraction. 5. Actually follow-up. 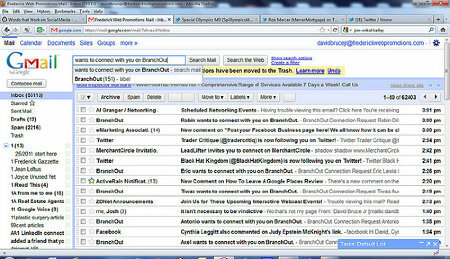 Once you've cleared your inbox, it's so freeing... you'll wanna break out the champagne and call it a day. But you still have work to do. Time to go into your "Follow-up" label and get cracking—decide what messages are most important and work your way down from there. You have five emails in the inbox (ah, only five—that'll be the day, right?!). One is an email from an employee, asking for info on next weekend's farmers market booth. One is a promotional email from a company you've never heard of. One is a neighborhood council invitation from the shop owner down the street. One is an incorrect wholesale invoice. One is your local website design company who needs to know what color scheme you prefer for the shop page. What do you do? First, unsubscribe from the promo email and delete it. Then, check your calendar and respond to the neighborhood council invite. Decide on the eCommerce color scheme and shoot that one off too. You just breezed through three emails in record time. You know you won't have the info on the farmers market until this afternoon, but since you owe a response, stick a "Follow-up" label on that, archive it and go back to it later. Same goes for the incorrect wholesale invoice, since you'll have to look back at your order and make some calls before responding. More than two minutes to handle? Along it goes to the "Follow-up" archive. Easy as that. If you need more tools to make your email work for you, try testing out some Labs in Gmail to see what you like (specifically, the Mark as Read, Undo Send and Send and Archive buttons are great). Boomerang can also be helpful and complements the Follow-up/Waiting system. 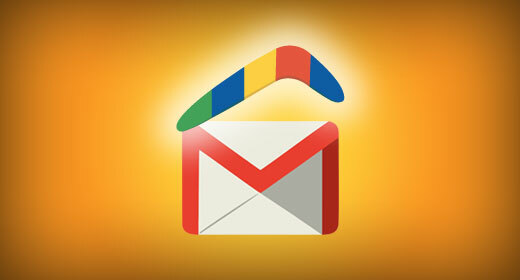 It's a software installed on top of Gmail that provides additional features. You can schedule emails to be sent later, return emails to your inbox based on criteria (like "if no one has responded in two hours" or "regardless," if you want to deal with it tomorrow and not today). We also love Mailbox, as we wrote about here. How do you handle your email on a day-to-day basis? Let us know in the comments!